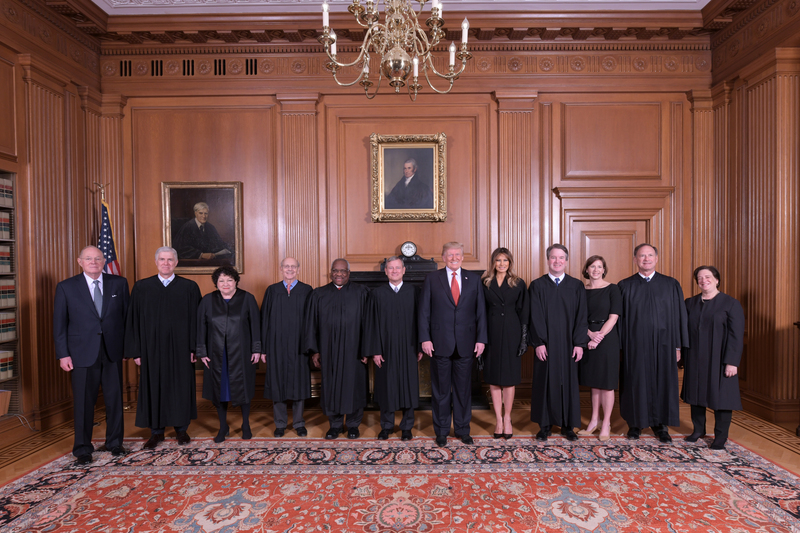 President Donald Trump and the first lady visited the Supreme Court Thursday for the investiture of Justice Brett Kavanaugh. Kavanaugh, who was confirmed on Oct. 8, has been participating in the work of the court for almost a month. By tradition, a ceremonial courtroom installation with various dignitaries follows the confirmation of a new justice. Thursday’s proceedings featured a roster of Republican legal luminaries, including former Attorneys General John Ashcroft, Alberto Gonzales and Michael Mukasey; Ken Starr, the federal judge turned independent counsel and scourge of the Clinton administration; Maureen Scalia, wife of the late Justice Antonin Scalia; former White House counsels Don McGahn and Harriet Miers; Federalist Society President Eugene Meyer and Leonard Leo, a Federalist Society vice president who informally advises GOP administrations on judicial confirmations. The ceremony also placed Senate Majority Leader Mitch McConnell and Judge Merrick Garland in the same room. Many of Kavanaugh’s former colleagues on the U.S. Court of Appeals for the D.C. Circuit were seated with Garland. Before joining his new colleagues, Kavanaugh sat in the well of the court in a late federal style mahogany chair former Chief Justice John Marshall used on the bench. Marshall, who served from 1801 to 1835, is widely regarded as the most consequential justice in the Supreme Court’s history. Historians advise that the chair was bequeathed to the court in 1936, having been maintained by various private owners in the intervening years. The chair has been used in the investiture ceremony of each new justice since 1972. Acting Attorney General Matthew Whitaker moved to have Kavanaugh’s official commission read aloud. Whitaker assumed the top post at the Department of Justice after Trump dismissed former Attorney General Jeff Sessions on Wednesday. Deputy Attorney General Rod Rosenstein and Solicitor General Noel Francisco joined Whitaker for Thursday’s investiture. Prior to the brief courtroom ceremony, the president met privately with the justices in their private conference room. The chief justice and the new associate justice generally appear in the court’s marble plaza after the investiture for a photo spray. The court elected to forgo this appearance, however, citing security concerns. Justice Ruth Bader Ginsburg was precluded from attending, after she fell in her chambers and broke three ribs on Wednesday night.